I went to see the Book of Mormon on Sunday and it was as hilarious as everyone has said. But I was just as struck by something I saw in the program. It’s no secret that the church takes a lot of heat in this show. And this was their response: a series of full-page ads right there in the playbill, alongside the production credits and cast bios. I think it’s a brilliant approach. To even place the ads is brilliant, but the tone and content is genius. The church could have engaged in an argument, presented rebuttals, denounced the production — nobody would be surprised. But they opted to stay out of the gutter. 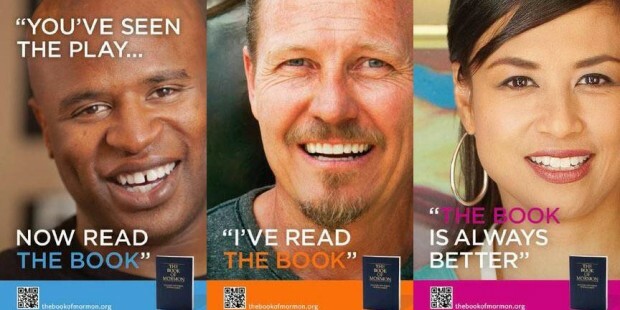 Bright, smiling (and diverse) faces, a fairly witty joke, a positive message, simple and friendly design, and an invitation to readers to learn more about the church. I’m not interested personally, but I could see how people could be attracted to the message and intrigued by the offer. Even their press statement takes the high road. When most of us are attacked, our first instinct is to lash out, to fight tooth and nail. It takes discipline to turn the proverbial cheek. So good for the Mormons. And if you have the opportunity, don’t miss this show. Crude and rude, to be sure, but ridiculously funny, beautifully performed and, at times, pretty damned touching . Thank you for posting this, what a great idea they came up with.